A nurse, who was working a Sunday shift at hospital, is said to be ‘broken’ after being informed by police that thieves had stolen all the wheels from her car. The nurse had been on duty last Sunday working on a ward at Craigavon Hospital. 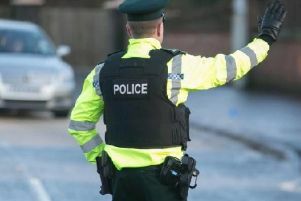 However at around 3pm on Sunday afternoon, the PSNI arrived at the ward and informed her that her car, which was parked on hospital property, had been badly vandalised. Thieves had removed all four wheels leaving the rest of the car perched on concrete bricks. A friend of the nurse said she is ‘broken’ after the incident on Sunday afternoon. He said she only had the car a few weeks and had been ‘mighty proud of it’. Writing on the PSNI Craigavon Facebook page, police said: “Our NHS colleagues to tremendous work, around the clock 24/7, 365 days a year. From long term care to urgent life saving interventions, they are so often the ones standing between us and death. “It is particularly disgusting therefore to hear of an attack on one of our nurses at Craigavon hospital, where all 4 wheels of her red golf GTD were removed while she was at work, caring for those in need. “She parked the car up at 720am and this was discovered at 3pm. “Someone must have seen something, or know where those wheels are now. “If you work in a garage and you’ve been offered these cheap since, and you can assist- do the right thing. “The wheels are pictured here, and the car itself was left ‘jacked’ up on blocks. Another person, who was disgusted that a member of the caring community should have her car vandalised, said: “How many passers by had walked past and ignored the fact that a bright red car had its wheels stolen and was rocking on two large stones under its door sills. “It wasn’t until 3pm did another member of staff notify the police. Calls have been made to alert staff, patients, visitors and the general public that even parking your car at your safe place of work now isn’t safe. He hoped that, with a little luck, no-one else ‘who spends long hard hours caring for others should have to go through a similar fate’. A spokesperson for the Southern Health and Social Care Trust said: “We are very concerned about this incident on the Craigavon Area Hospital site. “For this to happen to one of our nurses whilst they were at work providing care to ill patients, is shocking.